If you decide to do the dryer repair on your own, always make sure that the dryer is unplugged when performing any type of dryer repair. When all else fails, and you need to have someone repair your dryer, call us at (506) 872-9956 or submit your request on the Contact Us page and we will have a dryer repairman contact you promptly to assist you with your problem. Our customers are our greatest asset and your recommendation to your friends is you’re your greatest compliment to us. 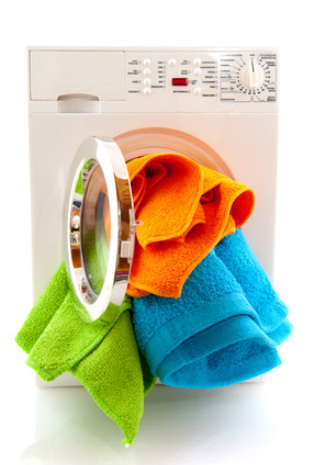 We are more than happy to answer any questions about dryer repairs that you might have. The dryer works by tumbling the clothing and blowing air through the drum. The drum has baffles protruding into the drum to keep the clothes from bunching up. The length of time the dryer runs and the air temperature are elements of the various drying cycles.A motor turns the clothes drum and also turns a fan (called the blower). The air flow from the blower passes over a heating element (in an electric dryer) or through a gas jet (in a gas dryer). The air then passes through the drum and out the back of the dryer through ducts to the vent which is typically located outdoors. 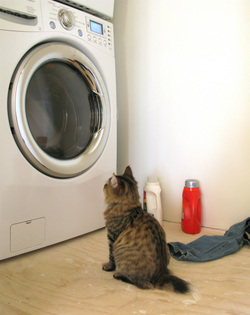 The dryer cannot operate until the door switch signals that the door is closed. The start button must then be pressed to enable the timer control. The timer control either regulates the length of time the dryer runs or it works in conjunction with a moisture sensor that measures the water vapor in the drum to determine when the clothes have dried. The temperature selector controls the maximum temperature inside the drum with the aid of thermostats. The heat turns on and off as needed to maintain the temperature. When the timed cycle ends, or the moisture sensor determines the clothes are dry, the drying cycle ends and typically a buzzer sounds to signal that the cycle has ended. Some dryers have a wrinkle prevention feature that will tumble the dryer every few minutes to prevent wrinkles from setting in. The dryer works by tumbling the clothing and blowing air through the drum. The drum has baffles protruding into the drum to keep the clothes from bunching up. The length of time the dryer runs and the air temperature are elements of the various drying cycles. A motor turns the clothes drum and also turns a fan (called the blower). The air flow from the blower passes over a heating element (in an electric dryer) or through a gas jet (in a gas dryer). The air then passes through the drum and out the back of the dryer through ducts to the vent which is typically located outdoors.